A few years ago the announcement of a Skate Park coming to Frisco took the city by storm. Residents were eager to hear more about it. Where? When? How big will it be? Last weekend, Frisco officially opened the 74-acre Northeast Community Park and Skate Park at the intersections of Coit Road and Panther Creek Parkway. The new space features eight lighted multipurpose fields, two cricket pitches, two pavilions, a playground and a pond surrounded by a walking trail. But the feature folks are flipping over most is the 47,000 square foot skate park. 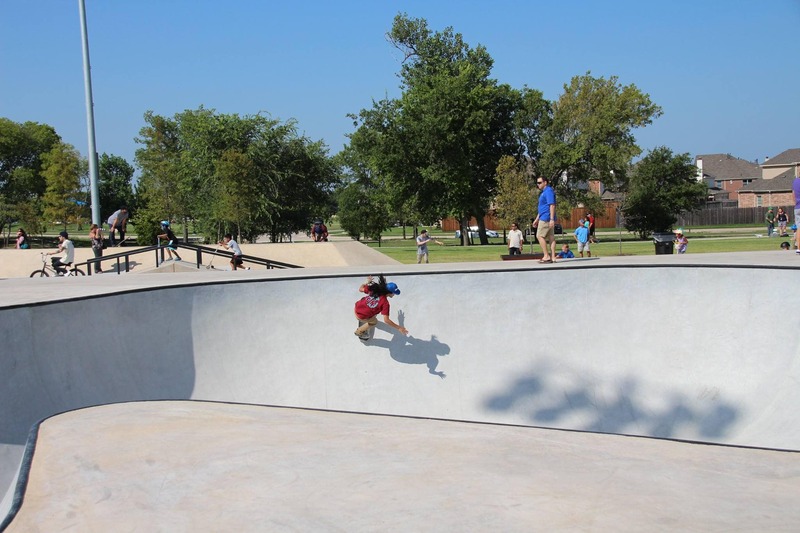 It’s the second largest skate park in the state of Texas, featuring multiple lines, rails, bowls, a half pipe, and a 16-foot concrete wave. For those of you that aren’t familiar with those terms or skating, let’s just say this park is a big deal. The Skate Park at Northeast Community Park caters to all types of ‘skaters’ – from those who use boards to others who prefer inline. Bikes and scooters are welcome, too. Last weekend, city leaders and staff, residents and visitors marked the occasion with a ribbon cutting. The price tag for Northeast Community Park & Skate Park is $17.5 million. The Frisco Community Development Corporation (FCDC), which is supported by a half cent sales tax, contributed $9.9 million. The city’s Parks and Recreation Board dedicated $5 million in impact fees to the project. Voter approved bonds made up the rest at $2.6 million. A lot of thought and careful planning went into this project by the developers involved. The plan and design were influenced by residents, skating enthusiasts and other stakeholders involved in the process. The plan was presented to the Parks and Recreation Board and the Community Development Corporation and approved by both. A 16-foot wide custom fabricated, perforated metal barrier that transitions between the plaza and flow bowl areas. The skate park is not supervised, and there are safety guidelines posted for the protection of the park and its visitors. The park is open from 8:oo am -10:oo pm, 7 days a week, which gives you plenty of opportunities for you to perfect your skill set. Tennis, basketball and sand volleyball courts, as well as a ‘splash pad’, are planned for future phases of construction at Northeast Community Park. This expansive outdoor recreation space gives the residents another form of entertainment that gets them outside and enjoying healthy activity.